Firstly time is relative; relative to your industry, your situation, your changing circumstances, your customers. They can often compress into one but the likelihood is that you can separate out each horizon for its value and time. An emerging framework to help navigate across the different horizons. This is my view of the distinctive aspects of navigation across the three horizon framework and where you shift your emphasis to ‘adjust’ your thinking and mindset to reflect the different horizon and aspects required to ‘see things differently’. To summarize the three horizons framework. 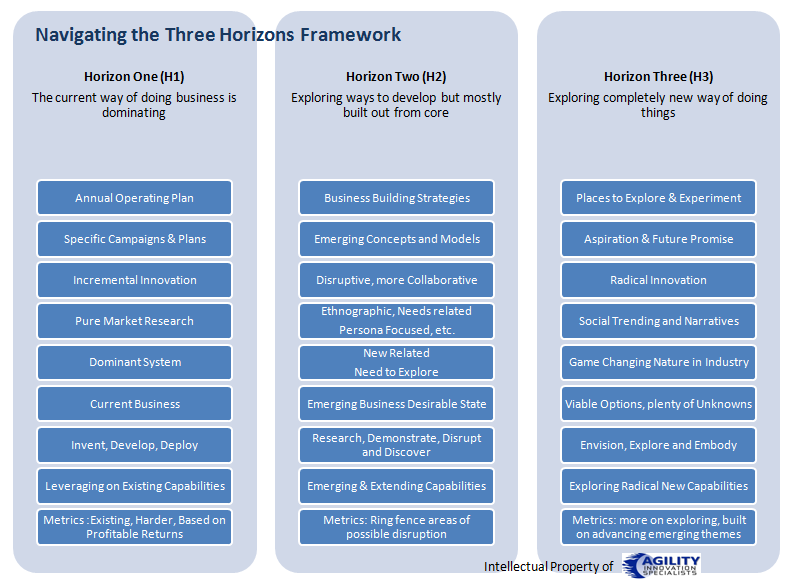 The three horizon framework has real value. Not only in scenario building but in gathering often conflicting voices around a framework that asks for different mindsets. Each of the horizons has a characteristic behaviour over time. Lastly, how you frame innovation, spotting firstly emerging dilemma’s, the tensions that occur between the focus on today’s business and the needs of adapting to tomorrows and finally, the ability to detect those weak signals to explore options, of where the markets will possibly radically alter in the future, so you are better positioned to seize and shape your place within this changed environment. Gary Hamel remarked “I don’t think you shuffle your way from one S Curve to the other. You have to jump.” The three horizons will help you in your jumping. “Seeing the Multiple Horizons” by Andrew Curry and Anthony Hodgson. Autumn 2008- Journal of Future Studies. Baghai M, Coley S & White D, “The Alchemy of Growth – kick starting and sustaining growth in your company”, Orion Business, London, 1999. Various McKinsey documents on this subject. NB: This is a part of three simultaneous blogs on the three horizon model exploring it more extensively, Part one is here , part two is here and part three here (this post). 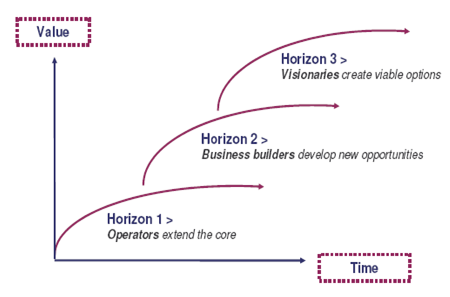 This entry was posted in Molecules and tagged Alignment of Strategy and Innovation, Innovating across different time frames, scanning the horizon, three horizon approach, three horizon framework, three horizons, Three horizons for innovation. Bookmark the permalink. On a side note: I was just wondering what will be the consequence on these 3 horizons if we apply the high risk-apetite based entrepreneurship layer on top of it. 3. As soon as they reach H1 in this case, they look for new H3’s by leaving the company to managers to continue. Again, thanks for the innovative trilogy. At AMD and the variable-rate mortgages, the transitions from the prior to the new S-curve were smooth and fast, but the jumps happened earlier in the timeline long before the smooth transition. When your core S-curve encounters commoditization, you cannot switch unless you’ve been investing in the research basis of the new S-curve for some time. Pingback: Innovation Excellence | Is Innovation Simple?